The brand new Ubiquity EP series features multiple artists, all exclusive tracks - all killer no filler. Tunes will be one-off collaborations, exclusive mixes, sneak peaks at future Ubiquity albums and new joints collected from artists around the world. All tunes will be 100% DJ friendly. This first EP will debut as a promo at WMC 2007, and will be released just two weeks later. EPs will be released simultaneously on vinyl, digitally via all the usual channels, with limited edition CD, too. Music from The Lions is the result of an impromptu recording session featuring members of Breakestra, Connie Price and the Keystones, Rhythm Roots All-Stars, Sound Directions, Plant Life, Macy Gray and more. Gathering at Orgone's Killion Studios in Los Angeles to lay down Jamaican inspired tracks the grooves combining riddims and dub mixing techniques with the global sounds of Ethiopia, Colombia, and Africa. One of the tracks from that session is a Rock-Steady, horn heavy version of Lyn Collins' "Think", which features guest vocalists Noelle Scaggs (The Rebirth) and Black Shakespeare (I & I Sound System). It's a DJ's get-out-jail-for-free floor-filling anthem. Hipster Wonkaz is what happens when Danilo Plessow (Inverse Cinematics/DITD) and Pablo Valentino (Faces Records/Kid Swing) combine a love of progressive beats and hiphop. Heavy sh*t that's deep, part broken, part hip hop, it's dancefloor bound cosmic jazz. Hailing from the French-German border region the two have enjoyed successful solo careers. Plessow is best known as one half of Inverse Cinematics recording big club tunes for Fluid Ounce, Faces and Pulver. Valentino is an in-demand DJ worldwide and runs the well-liked Faces label from Strasbourg, France releasing music by L'Aroye and working with the Jazzy Sport from Tokyo. Connie Price & The Keystones began life on Stones Throw's Now-Again label. Key member are Dan Ubick (Breakestra, Madlib's Sound Directions) and Todd M. Simon (Macy Gray, Antibalas, El Michels Affair). They quickly made a name for themselves combining elements of soul, afrobeat, dub reggae, late '60's/early '70's film scores, and psychedelic rock and jazz. Ubick and Simon have most recently been working with Big Daddy Kane, Quantic Soul Orchestra, Madlib, Greyboy, Aloe Blacc and Thievery Corporation. 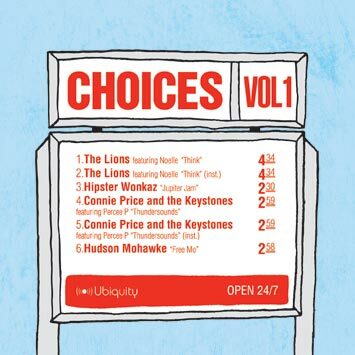 "Thunder Sounds" is the first cut from the forthcoming Connie Price & The Keystones album on Ubiquity. Guest MC Percee P attacks the government's bullying tactics on top the funkiest piece of cinematic soul a DJ could wish for. Little is known about the man from Scotland who trades bionic beats under the name Hudson Mohawke. Atari sounds and deadly bass lines will blast holes in your subwoofers and shake down the walls of your local discotheque. Be warned fans of instrumental hip hop, Mr Mohawke is about to let loose. Think Sa-Ra on steroids and run for cover.